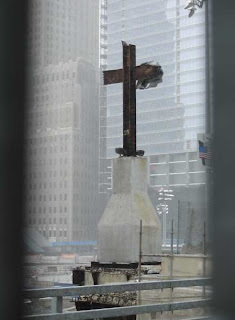 After the other day's release of the full Visit Missal by the Holy See, the one text that seems to have gotten the most attention is B16's Sunday morning prayer at Ground Zero. Msgr. Guido Marini, master of papal liturgical ceremonies, told Catholic News Service that the 19th-century pastoral staff, topped with a cross instead of a crucifix, "is becoming the usual one for papal celebrations." 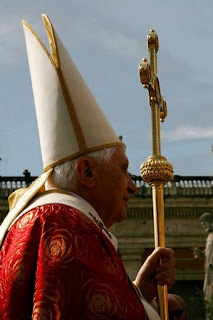 On Palm Sunday, March 16, Pope Benedict started carrying the older staff, which was used by every pope from Blessed Pope Pius to Pope Paul VI. "This is the typical staff used by the popes because it is a cross without a crucifix," Msgr. Marini said April 10. It is taking the place of the staff with the rugged crucifix on top that was created by Italian artist Lello Scorzelli for Pope Paul in the mid-1960s. The Vatican's yearbook, "Activity of the Holy See," includes a photograph of Pope Paul holding the Scorzelli staff on Easter 1965. But the piece has become closely identified with the pontificate of Pope John Paul II and is placed alongside a photograph of him in the renewed "Vatican Splendors" exhibit currently touring the United States. Msgr. Marini said there actually are two copies of the Scorzelli staff: the one in the exhibit, open in St. Petersburg, Fla., through May 11, and "the other which is here in the pontifical sacristy."